Tesco Cypriot New potatoes are an incredibly versatile and flavoursome vegetable that are only available in Tesco stores until March. 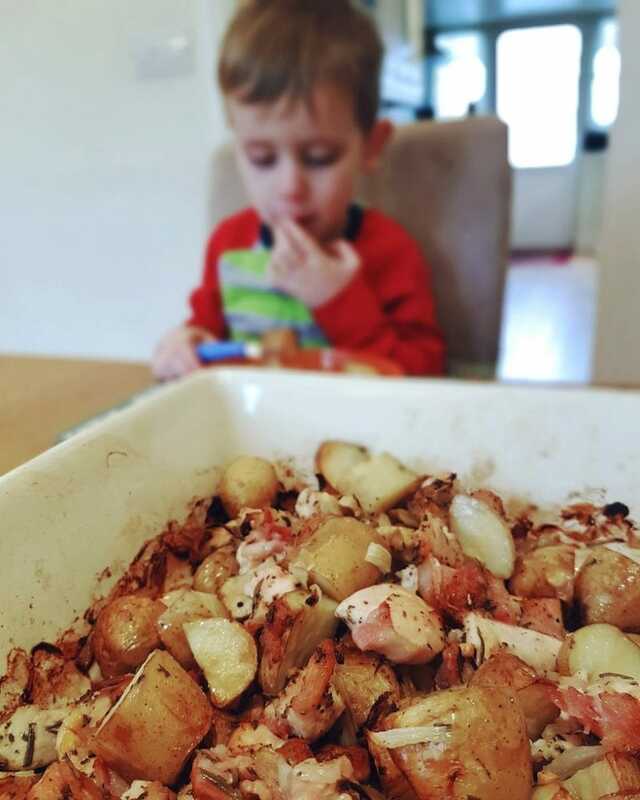 I am sharing one of our favourite dishes for new potatoes below – a gorgeous chicken and artichoke bake that includes bacon and garlic. It is the perfect comfort food for those gloomy mid-winter days. 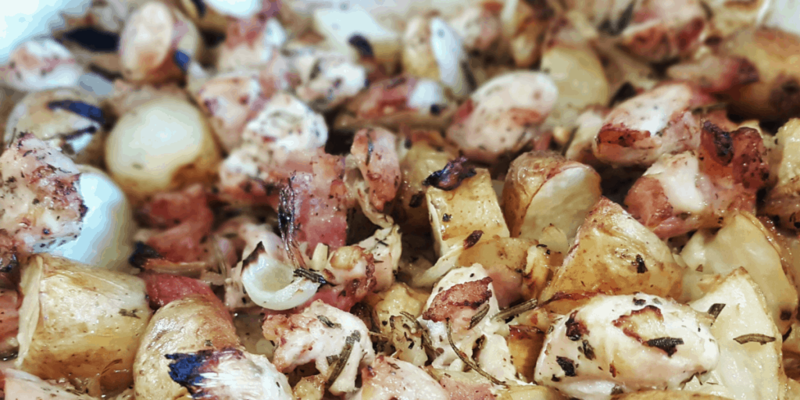 We made this video to show you just how easy it is to cook this dish with Cypriot new potatoes. There is also a more detailed, step-by-step method below. 1. Firstly, Pre-heat the oven to 200c / 180c fan / Mark 6 and get a large baking dish or tray. Everything goes straight in to this dish. 2. Next, wash your new potatoes in cold water and then chop to roughly bite-sized pieces, then the onion- not too fine or it might burn. You can use red onion for a bit of sweetness and colour if your prefer. 3. Then, drain the oil from the jar of artichoke hearts in to the dish, then empty out the artichokes and halve each heart. Coarsely chop the garlic- you can use more or less than two cloves to your taste. 4. Strip and finely chop the rosemary. You can use thyme as well, or instead, as you see fit. Add the mixed herbs. You could also splash in half a glass of white wine at this point if you’d like. 5. Roughly chop the bacon and chicken breast. You can use boned chicken thighs as they can be more moist than breast meat. 6. Season well and mix the whole dish thoroughly with your hands, distributing the ingredients evenly and coating everything in the herbs and oil. 7. Bake in your pre-heated oven for 1 hour, stirring the whole thing up with a big spoon after 30 minutes. Finally, remove from the oven and allow to stand for a few minutes before serving in warmed bowls, perhaps with a crusty rustic bread on the side. 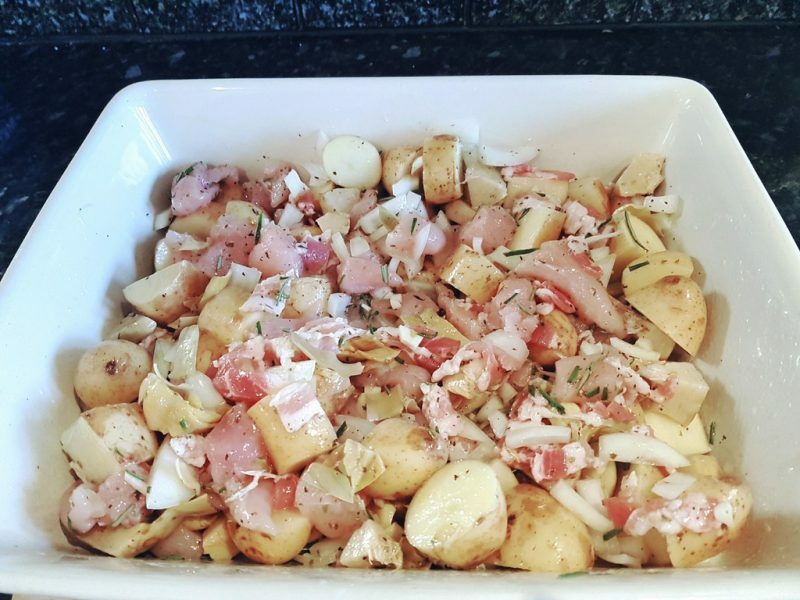 Cypriot new potatoes are the perfect potato to use in this dish. 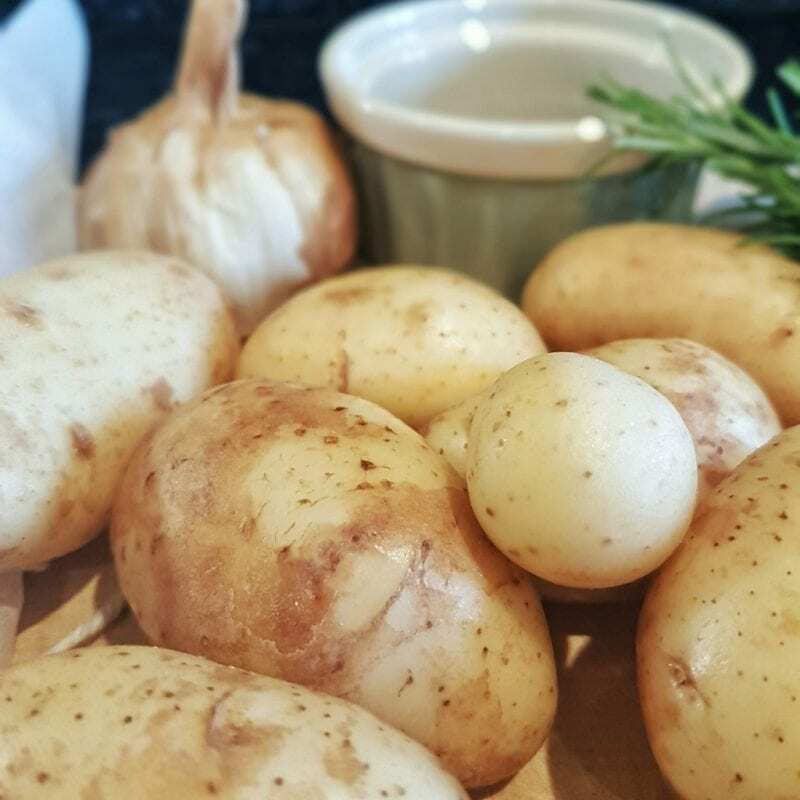 They require next to no preparation and, thanks to the mineral-rich, red Cypriot soil in which the potatoes are grown and harvested, they have a distinctive, rich, creamy yet earthy taste. For this reason they are just perfect for comforting dishes on cold winter days. Tesco Cypriot new potatoes are the ‘spunta’ variety and are very versatile. They are available in 750g packs or loose and they are ideal for boiling or steaming, roasting and even baked, as above. What’s more, they don’t need to be peeled, so preparation is minimal – just a quick wash in cold water. We absolutely loved them in this dish. 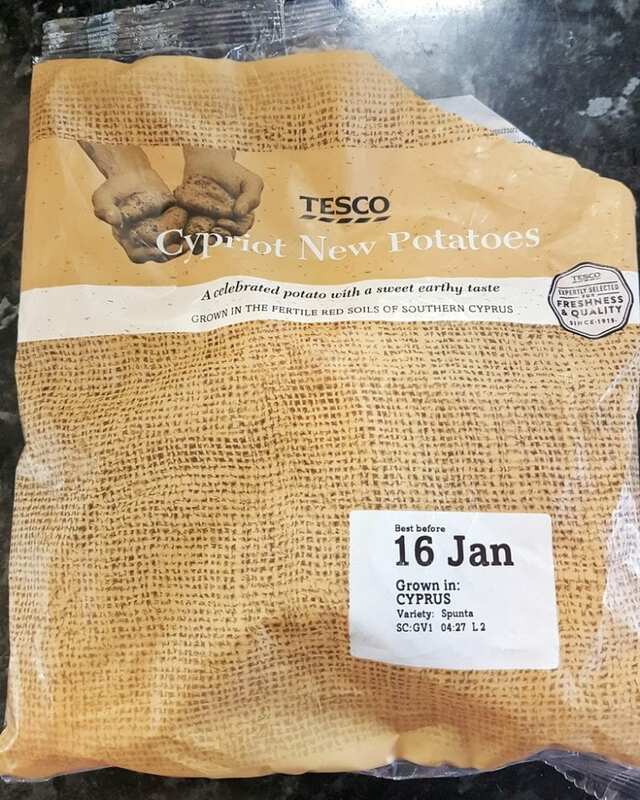 Remember, Tesco Cypriot new Potatoes are only available in most Tesco stores until the end of March. For a sweet comfort food recipe, why not check out our festive fruit cake. Lovely recipe, thank you! I do like new potatoes. I usually default to salad with them, so this is a great idea for something new! Looks delicious and quite straightforward. We’ll be trying this! I have never tried artichoke before so must give this a go. Looks yummy! Sounds yummy. Did the kids like it? That looks really tasty; I think I would serve it with my favourite broccoli!